This car normally comes in black & green with racing stickers, but I was able to find one in classic Ferrari red online. It's an awesome looking car, with good details and a really scale look. The wheels are spot-on replicas, there are faux brake discs & calipers, and the side view mirrors can be moved. More importantly, the car comes with a battery and charger and even batteries for the controller so if you buy it, you don't need anything else to run. Even better still, it uses "Band Select" technology which lets you change between four different radio frequencies. That means up to four of the exact same car can drive at the same time. 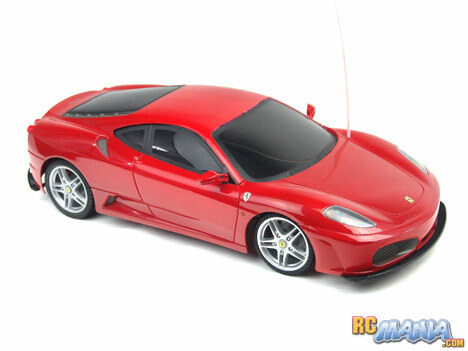 Now, just so you know, New Bright makes Ferrari F430's in two sizes, 1/16th scale and 1/10th scale. This is the 1/10th scale one, which is about 18 inches long. Since all batteries are included, all you have to do is charge up the main pack and insert the AA's in the controller. The main pack uses Fast Lane's exclusive design which slides & locks right into the car without requiring any wires or plugs to be connected. If you already have standard 9.6V battery packs, though, there's a place to connect those, so you're not out of luck. When I first gave the car a quick test drive indoors to make sure it was running properly, it felt like it had pretty good acceleration and speed. However, when I took it out to a wide open real RC race track, it didn't look so fast anymore. It was actually too slow for my radar gun to even pick up its speed. I'd estimate it at about 7mph tops. That's an okay speed by today's standards, but it's nothing to brag about. Nikko has shown us before that it's possible for a 9.6V-powered car to go up to twice that fast. What did impress me was the radio range, which is well over 100 feet. The steering is also very responsive, meaning when you tell the car to turn, it turns immediately with no hesitation. I really wish it had digital proportional steering, though. To get around wide or medium-wide turns on the track I had to push the steering in little pulses to keep from turning too much. Well, I'm not at all impressed by the speed of this car, but it is a decent value for the price, considering the inclusion of the batteries & charger. New Bright recommends that the car be for kids at least 6 years old, and I think 6 to maybe 9 year olds would be able to enjoy it, with the younger kids even finding the car to be pretty fast, especially for their size.